When it comes to Men's Health Month and healthy eating, we must understand how everything we eat and drink matters, and we must know our numbers. Spectrum's integrated care team comprised of our providers specializing in adult medicine, behavioral health, and nutrition remind us monthly during the "Food As Medicine" series by providing tips on preventing and healing diseases with a plant-based diet and providing blood pressure screenings. This month's session focused on limiting saturated fat (butter, fat around meats) and trans fat (cookies, cake, icing, crackers) while increasing intake of unsaturated fat (plant sources such as seeds, nuts, olives, fish). Join us for our upcoming "Food as Medicine" sessions on Tue. July 10th and Tue. August 14th from 4-5:30pm at Spectrum Community Health Center located at 5201 Haverford Ave. Call 215.471.2761 for more information. Please be safe and see you on Thursday, the 22nd. Heart Disease is still this country's number one cause of death, and diabetes increasingly plagues the population. In Philadelphia, heart disease and stroke are the 1st and 3rd leading causes of death. Sadly, even children are experiencing a meteoric rise in diabetes. With respect to increasing obesity and food-related contributions to climate change, many groups nationwide are advocating for healthier food policies and programs. Along those lines, food activists and public health advocates have rallied for school lunch reform and cooking classes in schools; organic and locally produced crops instead of genetically modified crops; farm preservation, farm bill reform and food safety regulation; urban agriculture and access to healthy food; proper nutrition labeling; and regulated food marketing to kids. The Philadelphia Office of Health Information and Improvement has been partnering with Federally Qualified Health Centers and healthcare facilities to sponsor learning collaborations geared towards improving care for chronic illness and preventing diabetes and hypertension. Hence, Spectrum Health Services has taken on the role of educating the community about how to address diabetes and heart disease prevention through a series of monthly classes entitled "Food As Medicine" which champions adopting a plant-based diet. Plant-based dieting derives from plants, including vegetables, whole grains, nuts, seeds, legumes, and fruits. 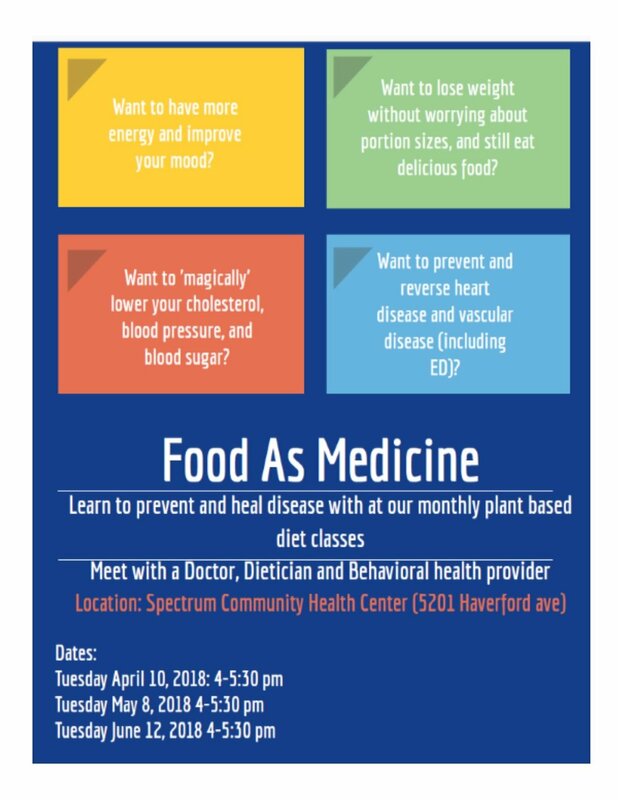 Our classes, facilitated by a team comprised of a medical provider, a nutritionist, and a behavioral health provider, will discuss portion control and promote healing through our food choices. The upcoming sessions will take place at the Spectrum Community Health Center on April 10th, May 8th, and June 12th from 4pm - 5:30pm. Spectrum welcomes the community to join us and experience the joy of growing and eating healthy, tasty food with friends and family. For more information, contact us at nutritionist@spectrumhs.org. DUE TO INCLEMENT WEATHER, SPECTRUM HEALTH SERVICES WILL BE CLOSED TODAY. Appointments will resume tomorrow, Thursday, March 8, 2018. American Heart Month is a perfect time to promote heart health for Philadelphia families. 2,300 Americans die of cardiovascular disease each day, an average of 1 death every 38 seconds. At the time of the first American Heart Month in 1963 under President Lyndon B. Johnson, more than half the deaths in the U.S. were caused by cardiovascular disease. Cardiovascular disease, heart attacks and strokes are still the world's leading causes of death with more than 17.9 million deaths annually. That number is expected to rise to more than 23.6 million by 2030. Last Friday, Spectrum's Chief Medical Officer, Dr. Gary Davis introduced Dr. Akilah Bates, who has partnered with the American Heart Association to lead the charge for Spectrum in raising awareness about cardiovascular disease and save lives. During her presentation, she noted that the key to living healthy is to make healthy choices. She spoke on how one must consider age and family history when it comes to heart health then make the appropriate changes to diet, limit stress triggers, and get good amounts of sleep which will lower heart health risks by as much as 80 percent. February is National Children's Dental Health Month. Each February, the American Dental Association (ADA) sponsors National Children's Dental Health Month to raise awareness about the importance of oral health. Spectrum was in on the action as well with our COO Brenda Noel introducing our dentist, Dr. Michael Adams, who then shared his expertise in oral care and to dispel some dental myths with constituents. Covering topics from brushing with the appropriate bristles, effective flossing, and avoiding tooth decay to understanding the differences between crowns and bridges, how to properly clean dentures, and how to manage care with periodic check-ups. Our hygienist, Shemika Whiters, our dental office manager, Aisha Wynne, and Lyvette Velasquez, our dental assistant concluded the presentation by passing out a brochure preventive oral health guidelines and treatment options for the attendees to take home . DUE TO INCLEMENT WEATHER CONDITIONS, ALL SPECTRUM HEALTH SERVICES LOCATIONS ARE CLOSED TODAY, THURSDAY JANUARY 4, 2018. Spectrum Health supports the community with information that will support our academic health which fortifies our physical, mental, emotional and social health. On Thursday, December 28th, 2017 from 6 – 8 pm, the African Episcopal Church of St. Thomas | Anderson Hall will host both College: Everything You Want to Know - An Informal & Informative Info Session An Informal & Informative Info Session and College: Everything You Want to Know - What Parents Should Know About College. Located at 6361 Lancaster Avenue, Philadelphia, PA 19151, these events enable participants to hear from and talk to current college students and recent college graduates about various aspects of college life and life after college. There will be a separate discussion at the same time hosted by parents of college students and recent graduates, and food will be served. For more information or to rsvp for either event, contact wpfox3008@verizon.net by 12/27/2017. In October, Spectrum Health Services recognized National Breast Cancer Awareness Month in order to encourage communities, partner organizations, and families to spread the word about the importance of mammograms for the early detection of breast cancer. With breast cancer being the second most common kind of cancer in women and approximately 1 of 8 American women slated to contract it in their life, the urgency abounds. However, though very rare, men can get breast cancer as well. Spectrum encouraged the employees to wear pink to commemorate the day as the staff learned more about the condition that has touched the lives of its family members and is affecting a handful of its patients. Influenza aka "the flu" is a serious disease that can lead to hospitalization and if left unchecked, even death. Every Flu season, typically October thru May, sees different trends and its symptoms affect people around the globe differently because of various strains of flu viruses. The reason people call the various strains "the flu" instead of being more specific to the strain is because each of the viruses function more or less the same around the same time of year. The Flu viruses typically enter the body through the eyes, nose and mouth then causes infections in the upper respiratory system (nose, sinuses, mouth, throat, bronchial tubes, lungs). It could eventually lead to more serious issues such as severe flu infection and viral pneumonia or viral infections in other organs. A lot of patients who have immunological diseases, or an organ transplant, have cancer or other conditions may not be strong enough to get a flu vaccine, but if those around them who are vaccinated can develop a "herd immunity," so that the few people who may not be able to get the vaccine will not get infected. The flu shot may not fully prevent a person from getting the flu; the vaccine's purpose is to reduce the number of severe flu illnesses that result in hospital visits. Hence, a vaccinated person will not get as sick as as someone who is not vaccinated. Spectrum Health Services encourages the community to be educated about breast cancer as well as get their flu shots, and the Spectrum staff leads by example. Click here to see Spectrum's Breast Cancer Awareness & Flu Shot photos. For more information on Influenza and flu vaccinations, click here. For more information on breast cancer awareness, click here. On Saturday Nov. 4, a small team of Spectrum Health Services staff joined in The Philadelphia Heart Walk, a team-building event focused on raising heart rates while raising funds and awareness about America's No. 1 and No. 5 killers – heart disease and stroke. More than 15,000 members of the community joined family, friends, and co-workers walked the 3-mile trail around Philadelphia's iconic Citizen's Bank Park in honor of a loved one who struggled with the ailments, showing their commitment to leading healthy lifestyles. The event closed with a kid and pet-friendly festival with loads of activities, refreshments, and live entertainment. For event photos, click here! For more information on #PhillyHeartWalk from our friends at the American Heart Association, click here! Spectrum Health Services, Inc. (Spectrum), celebrated 50 years of primary health care service to the residents of Philadelphia at the Crystal Tea Room on Thursday, September 21, 2017. The celebration was attended by more than 350 guests and featured founding board members Trudy Haynes and William Brown, III, Esq. (pictured) the Rev. Dr. Lorina Marshall Blake, president, Independence Blue Cross Foundation (Access to Care Honoree), William H. Brown, Esq. (founding board member), Trudy Haynes, founder. Standing L-R, Glenn Ellis, Sr., master of ceremonies for the evening, Phyllis B. Cater, Spectrum president & CEO and Cleosie Kirkland, Spectrum board of directors, chairman. PIDC had the privilege of attending the 50th Anniversary celebration of its client Spectrum Health Services, Inc. At which they also honored 50 Community Gems whose work aligns with their mission. PIDC’s Marla Hamilton was among those being honored. Spectrum is celebrating 50 years of service as a healthcare provider in the City of Philadelphia. Its model of integrated care provides services for all life-cycles and addresses the complexity of medical and social/economic issues facing its patients and the residents in the communities served. Its range of services include: Pediatrics, Ob-Gyn, Adult Health, Dental, HIV/AIDS Outreach and Primary Care, Case Management, Behavioral Health, Nutrition and Care Coordination. Among its crowning achievements is the construction of a 36,000 sq. ft. state of the art Silver LEED certified building in West Philadelphia which serves as the headquarters and flagship for the organization. PIDC provided financing for the construction of this project.